So, I can't find any topic on OC, so here's one! I'd love to see artwork of your original characters, that creation you are so proud of. Maybe an imaginary friend or a mascot, or just the hero of your latest work! I have my own, and you know her well! Her name is Blue. How about your creations? Let's share them! This is also a good place to ask questions about them, if you wanna know more about anyone's creation! Alright, I guess I'll show you a bit about my character. His name is Hex Scout. I got the name from my best friend (who I deeply miss) while we were brain storming for a name. The name Hex comes from the fact that most of the things I used are hexed items which are community made items for games that never made it in. At the time I never had the character design done, so I used Scout from Team Fortress 2 as a temp placeholder. After a while, it kinda grew on me so I made his last name Scout. His design a mixture of style I love. He mostly looks like the Scout, but the body shape is mostly based on Jak from the Jak and Daxter series. He has a this strange infusion on his right chest (think of Senator Armstrong nanomachine) that faintly glows blue energy. Hex doesn't have any pupils, instead his eyes are modified to clearly view in the dark. He wears hover boots that obviously sends him up into the air. The art style is a mixture of Lab Zero's Skullgirls, and Creature Box's Ratchet and Clank style. I have a lot more to put up, but I'm still thinking of things at this time. To put what I have short, Hex is a scientist who travels the multiverse and is somewhere around his early 20. He visits different worlds and universes and setting up installations across the multiverse, recruiting hundreds of people to bring peace from those who wants to destroy all things living things. I'll give this a shot too! 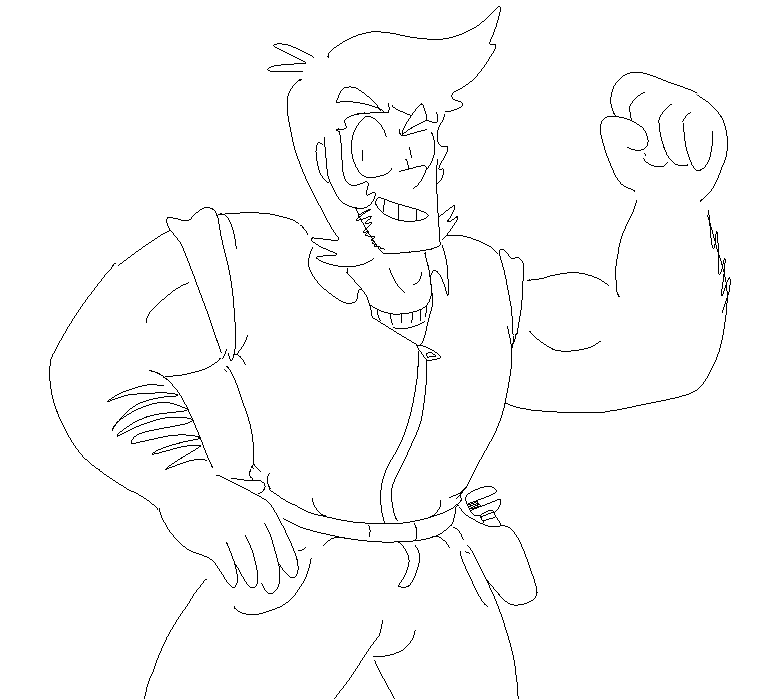 Jeoff is a muscular mechanic who builds machines for a "living". He's a bit of a douche but has a heart of gold, and is willing to help others that he cares for. He really prides himself on his looks and is anything but modest about it. He left high school when he was 17 and decided to go into his own business of making machines, his one love. However, it didn't go as planned and he ended up being broke and having to borrow money from the mafia to pay for his business. Now he lives with one of his robot companions in a abandoned garage where he builds other machines. He constantly gets threats from the mafia asking back for his money since he never safes enough money to pay them back, frequently spending it on himself for fun. Soon enough he meets a kid named Max (who I don't have a picture of yet), who finds his garage after following one of Jeoff's robots. Jeoff befriends him after finding out the kid has an interest in robots, much to the dismay of Max's parents. There's a lot more lore to talk about, but I'll hold it off since it becomes it's own story. A lot of my inspiration for Jeoff was with Wario, being a very brutish character. Now Jeoff isn't greedy like wario, but his rudeness is pretty similar. He doesn't care for anyone in his way and will deal with them physically. Jeoff usually uses something called The Falcon Glove, which isn't in the picture. It is a glove he built that allows him to pack a POWERFUL punch, which, he says, is "like a Falcon punch." The drawing of him is a doodle I did really quick, I'm still working on him. I like how creative people are here! I still would love to see more, and who knows maybe it's a good place to make stories out of these characters! I have two OCs for a story I would like to write. Sadly, I need to flesh out their personalities more and get some drawings cooked up, but that sounds like a neat little side project I could work on. That's nice! I'm looking forward to it! Don't hesitate to share what you got, we can give feedback on them! I have a friend who is really good at creating OC's. Myself... never really got anything all too interesting. I love reading about other people's creations, though. You should try though. Sometimes, even if you don't think you have any ideas, you might come up with something interesting! Thanks, Rei! I'm proud of her eyes, for some reason! Don't let this topic die! I wanna see/read about your OCs, guys! I haven't been using my computer too too much lately for the forums latley,so I only have the sketches. -n- I'll try to keep this thread alive somehow. I noticed you use that birdie a lot, it's so cute! I'm probably going to draw some stuff to post here on the character. It probably is gonna take a while since it ain't so easy to make a quick drawing with a mouse on pc. Sine everyone else is doing this introduction thingy. I'll just add a few. Con is my age, 17, along with his older friend, Katelyn who is only a year older. They were supposed to be younger, but only in camp drawings. Where Con would be 14 and Katelyn 15. It was changed to fit my age, and since Katelyn always has to be older by a year she's 18. I just thought I should share the drawing of WS Hex Scout that I finished up a few minutes ago.